You will be met by a Christian Holyland Tour representative at the airport who will accompany you to your hotel. Relax in your hotel for the night. Begin your tour with breakfast and then a visit to the ancient Joppa (Jaffa), the location of the house of Simon the Tanner (Acts 10: 9-16) and the place of the Miracle of the resurrection of Tabita (Acts 9: 36-43). After your visit you’ll drive north to Caesarea Maritima where you will visit the Roman Theater, Herod’s Palace, the Palace of the Roman Procurator (Acts 23: 23 and Acts 26: 23 – Paul; Acts 10: 20-48 – Peter and Cornelius), the Amphitheater, Crusaders’ City and the Harbor. Next you’ll head to Mount Carmel to visit the Monastery of the Muhraka, where Elijah fought with the Baal priests. You will ascend to the roof of this Monastery for a beautiful view of the Jezreel Plain. After this you’ll travel through the Druze villages, Daliyat el Carmel and Usifiya, and then on to Haifa for a panoramic view of the city and harbor. Last on the list of today’s destinations is a visit to Acre to see the old city, its walls, the Knights’ Halls and the Harbor and then a drive through Galilee to Tiberius for the night. Enjoy breakfast and then it’s off for a boat ride on the Sea of Galilee, where Jesus walked on the water (Matthew 14: 22-23). Your boat ride will end at Ginnosar with a stop to see the Ancient Boat dating from the time of Jesus that was found nearby. Shortly after that you’ll drive to the Mount of Beatitudes (Matthew 5: 7) to see the heptagonal church that was built by the Italian architect Berluzzi. From there you’ll head to Tabgha, to visit the Church of the Loaves and the Fish (Matthew 14: 14-34) followed by a drive along the northern shores of the Sea of Galilee to Capernaum. It’s here in Capernaum where Jesus lived in the house of Peter and performed his miracles and healings (Matthew 4: 13, Matthew 8: 14-15). Next you’ll travel through the Golan Heights, and then to Banyas, the ancient Caesarea Philippi (Matthew 16: 13-20) known to be one of the main sources of the Jordan River. Your day concludes at the Yardenit Baptismal site near the southern part of the Sea of Galilee after which you’ll return to your hotel for the night. Your day begins with breakfast and a drive to Cana to see the church that stands on the spot where Jesus performed his first miracle. After that you’ll continue on to Nazareth to visit the Church of Annunciation (Luke 26: 28) and Nazareth Village where the Bible comes to life. Next you’ll travel through the Jezreel Plain to Megiddo, also called Armageddon as it is reputed to be the place where the last battle of mankind is due to take place (the Apocalypse of St. John). Here you’ll visit the Museum, the 5,000 year old city whose Gates date from the times of King Solomon, the old Canaanite temples and the water tunnel dating back to King Ahab. From here you’ll travel south through the Jordan River Valley for the ascent to Jerusalem where you will spend the night. Your day begins with breakfast and a drive to Cana to see the church that stands on the spot where Jesus performed his first miracle. After that you’ll continue on to Nazareth to visit the Church of Annunciation (Luke 26: 28) and Nazareth Village where the Bible comes to life. Next you’ll travel through the Jezreel Plain to Megiddo, also called Armageddon as it is reputed to be the place where the last battle of mankind is due to take place (the Apocalypse of St. John). Here you’ll visit the Museum, the 5,000 year old city whose Gates date from the times of King Solomon, the old Canaanite temples and the water tunnel dating back to King Ahab. From here you’ll travel south through the Jordan River Valley for the ascent to Jerusalem where you will spend the night. Following breakfast, you’ll visit David’s City, the most ancient part of Jerusalem and enjoy sloshing through Hezekiah’s water tunnel (note that strap-on water shoes are needed). 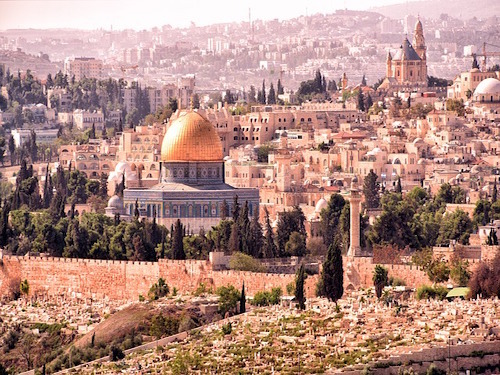 Next you’ll walk along the foundation stones of the Western Wall of the Temple Mount in the Rabbinic Tunnels* and then on to Mount Zion to visit the Tomb of King David and the Room of the Last Supper. The last stop of the day is a wonderful summary of Jerusalem history at the Tower of David Museum. After that you’ll return to your hotel for the night. Shortly after breakfast you’ll be heading to Bethlehem* to visit the Church of the Nativity (Luke 2: 1-7). Next you’ll drive back to Jerusalem to the area of Golgotha (place of the skull) and the Garden Tomb to celebrate the resurrection with Communion and a time of praise. From the Garden Tomb you’ll proceed to Yad Vashem to visit the Memorial to the victims of the Holocaust, followed by a drive to the Israel Museum with its Shrine of the Book, where the Dead Sea scrolls are kept. You will also see the Model of Jerusalem as it was at the time of the Second Temple. Then it’s off to see the Menorah in front of the Knesset, the Israeli Parliament, before returning to your hotel for the night. Following breakfast you’ll drive via the Good Samaritan Inn (Luke 8: 25-37) to the mountain fortress of Massada, stronghold of the Jews in the war against the Romans. Ascend to the fortress via cable car to visit the palaces of Herod the Great with their Roman baths and pools. Then descend for a possible “dip” and “float” in the salty water of the Dead Sea – the worlds lowest place. On the way back to Jerusalem, you’ll stop in Qumra, the city of the Essenes. It’s here the Dead Sea scrolls were found in a cave by a shepherd. You’ll then head back to Jerusalem to your hotel for the night. Enjoy a leisurely breakfast and some free time for shopping in Jerusalem before your late morning check-out from the hotel. After check-out, you’ll visit Ein Karem, the birthplace of John the Baptist, and continue on to Beit Shemesh and the Elah Valley, where David fought Goliath. Driving via Emmaus (Latrun) (Luke 23: 39-44), you’ll proceed to Abu Ghosh, the biblical Kiryat Ye’arim, where King David brought the Holy Shrine back to Jerusalem. You’ll then enjoy a delicious Middle Eastern farewell dinner in Abu Ghosh and leave for the airport for your flight back home. Arrive home and begin planning your next trip to the Holy Land.